"Live thou for England, We for England died"
34020 Gunner John Austin Baggaley of XII Corps HQ, the Royal Field Artillery. Son of Charles Chapman and Alice Elizabeth Baggaley (née Wright) of Dronfield Grammar School, nr. Sheffield. Born in Chesterfield in the December Quarter of 1892. Died 11 July 1917 aged 24. Captain David Humphrey Bellamy of the 10th Battalion, attached to the 9th Battalion, the Devonshire Regiment. Son of Lt. Colonel Charles Vincent Bellamy DSO and Ellen Bellamy (née Hawkins) of Leigh Holt, Crapstone, Yelverton. Died 2 April 1917 aged 22. He also served at Salonica. 10422 Sergeant William John Bennett of the 8th Battalion, the Devonshire Regiment. Son of William H and Elizabeth A Bennett (née Duke). Born in Milton Comb in the June Quarter of 1894. Died 14 January aged 24. Buried in the churchyard at Buckland Monachorum. Awarded the Military Medal. 283083 Mechanician Alfred James Bovey of the Royal Navy, HMS Indefatigable. Parents not yet identified; husband of Beatrice Bovey of 4 Hermon Terrace, Peverell, Plymouth. Born in Harbertonford 10 September 1876. Died 31 May 1916 aged 39 at the Battle of Jutland. 2nd Lieutenant Arthur Roberts Brown of the 2nd Squadron, the Royal Flying Corps, attached to the Royal Field Artillery. Son of Joan and Alice Maud Adams Brown of Torlands, Yelverton. Born in Plymouth in the September Quarter of 1894. Died 6 April 1917 aged 22. 174322 Driver Arthur Andrews Cannon of the training Depot, the Royal Engineers. 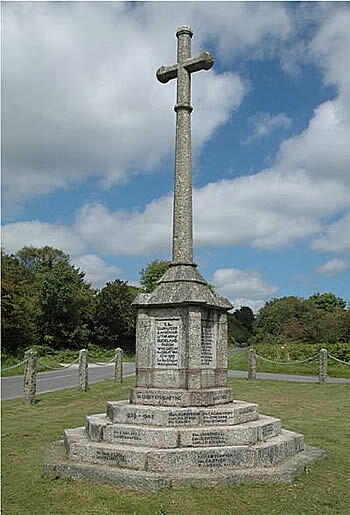 Son of George and Eliza Cannon (née Andrews); husband of Elizabeth Cannon (née Doidge) of Crapstone, Yelverton. Born in St Germans, Cornwall in the June Quarter of 1883. Died 17 November 1916 aged 34. Buried in the churchyard at Buckland Monachorum. Lieutenant Henry Featherstone Clark of the 11th Battalion, the Devonshire Regiment. Son of Henry Atwood and Julia Marion Clark (née Featherstone) of Buckland Monachorum. Born in Kingsclere, Hants in the June Quarter of 1894. Died 3 May 1917 aged 23. K/22305 Stoker 1st Class Sidney Crocker, Royal Navy HMS Sub. E30. Son of the late Samuel and Mary Crocker; brother of Frank Crocker (Stoker in the Royal Navy). Born in Milton Combe, Yelverton 29 June 1894. Died 22 November 1916 aged 22. K14884 Stoker 1st Class George Hedley Crossman of the Royal Navy, HMS Indefatigable. Son of Joseph and Amelia Crossman of 2 Richmond Terrace, Buckland Monachorum. Born in Buckland Monachorum 20 April 1894. Died 31 May 1916 aged 22 at the Battle of Jutland. 3497 Lance Corporal William John brown Crossman of the 2nd Battalion, the Australian Infantry. Son of William Joseph and Amelia Crossman of 2 Richmond Terrace, Buckland Monachorum. Born in Buckland in the March Quarter of 1890. Died 27 October 1917 aged 27. He was an Australian citizen. Lieutenant Henry Mills Goldsmith of the 1/5th Battalion of the Devonshire Regiment, attached to the 2nd Battalion, the Lincolnshire Regiment as ADC. Son of John Philip and Elizabeth Goldsmith (née Mills); husband of Sybil E. Goldsmith of Rockmoor, Yelverton. Born in Compton Gifford 22 July 1885. Educated at Jesus College, Cambridge. Member of the University Boat Club team at the 1908 Olympic Games Killed in action 9 May 1915 aged 29 - his remains were never recovered. 345614 Private Bernard William Halls of the 16th Battalion, the Royal Devon and Royal North Devon Yeomanry). Son of William G and Fanny Halls (née Vickery). Born in Bickleigh, nr. Plymouth in the September Quarter of 1887. Died 3 December 1917 aged 30. Midshipman Malcolm Alfred Milner Harris of the Royal Navy, HMS Defence. Son of Admiral Sir Robert Harris and his wife Lady Florence. Born in 1899. Came to live at Yelverton. Died in the Battle of Jutland 31 May 1916 aged 17. 17537 Private Harold John Maker of the 1st/4th Battalion, the Oxford and Buckinghamshire Light Infantry. Son of Alfred and Kate Maker (née Boon). Born in Tavistock in the March Quarter of 1898. Died 21 April 1917 aged 19. 43240 Private Michael McAssey of the 9th Battalion, the Devonshire Regiment. Son of Abraham and Sarah Jane McAssey of Graigue Hill, Carlow. Born in Carlow, Ireland in 1887. Died 7 May 1917 aged 30. 2nd Lieutenant James Voaden Moore of the 6th Battalion, the Oxford and Buckinghamshire Light Infantry. Son of Mr and Mrs J Moore; husband of Gertrude Augusta Moore (née Salborn) of 33 Hillside Avenue, Mutley, Plymouth. Born in 1887. Died 2 December 1917 aged 30. J/1595 Leading Seaman Horace James Palmer, Royal Navy, HMSubmarine E36*. Grandson of Thomas and Rachel Palmer of Buckland Monachorum and brought up by them. Born in Yelverton 25 November 1891. Died 19 January 1917 aged 25. *E36 sank in a collision with another submarine, E43, off Harwich. There were no survivors. K169 Leading Stoker Austin Cotton Parnell of the Royal Navy, HMS Indefatigable. Son of Thomas and Elizabeth Parnell of Pancrasweek. Born in Bridgerule 9 October 1884 ( the family came to Lifton Down to live). Died 31 May 1916 aged 31. Referred to as JOHN in Naval records. 135090 Gunner Horace A Parnell of the 328th Siege Battery, the Royal Garrison Artillery. Died 21 September 1917. This seems to be an error. The memorial entry is for Midshipman R Percy, RN. We think it should be A. W. Percy RN. During the 1st World War, Lord Algernon Malcolm Arthur Percy was living at Bickham House in Buckland. He and his wife Lady Victoria ( née Edgcumbe) had two children - Katherine and Algernon. Their son, Algernon William Percy of the RN Reserve, HMS Queen Mary, was killed 31 May 1916 aged 31 at the Battle of Jutland. He was unmarried. K8930 Stoker 1st Class John Sampson Prior of the Royal Navy, HMSubmarine E16*. Son of William and Elizabeth Ann Prior of Milton Combe, Yelverton. Born in Yelverton 20 November 1891. Died 22 August 1916 aged 23. *Mined in the Heligoland Bight. There were no survivors. 2nd Lieutenant Charles Bouchier Rodd of the 2nd Battalion, the Devonshire Regiment. His birth was registered in East Stonehouse in the September Quarter of 1897. He died 30 October 1916 aged 19. His medals were sold at auction 3 September 2008 when it was suggested that he was the son of Edward Rodd of Turnworth House in Dorset and his wife Annie but this is not yet confirmed. His name was also linked to Sandhurst. Lieutenant Leslie Hicks Rolston of the 182nd Siege Battery, the Royal Garrison Artillery. Son of George Theodotius and Elizabeth Manning Rolston of Yelverton. Born in Stoke Damerel in the September Quarter of 1896. Died 1 April 1918 aged 21. 202474 Private William Henry Rowe of the 1st/4th Battalion, the Ox. and Bucks. Light Infantry. Parents not yet known. Born in Buckland Monachorum. Died 19 October 1917. "2029 Private Walter Guy SANSOM, a 30 year old farmer from Yelverton, Devon, England. He enlisted on 22 January 1915; and at the conclusion of the war returned to Australia, 15 January 1920." An Embarkation Roll reveals that he embarked from Melbourne, Victoria on board HMAT Ulysses on 25 October 1916 bound for Europe where he served in 13 Light Horse Regiment. He gave the name of Mrs E. Sansom* of Yelverton as his next-of-kin. *Widow of Louis Sansom formerly of Plymouth. 240720 Private Charles Southcott of the 5th Battalion, the Devonshire Regiment. Son of Henry and Mary Jane Southcott. Born in Lamerton in 1888. Died 8 March 1916 aged 28. Captain Charles Norman Spooner of the 5th Battalion, the Devonshire Regiment. Son of Edwin Charles Spooner ( a well-known Plymouth business man) and his wife Alice Mary Spooner (née Tucker). Born in Plymouth in the June Quarter of 1878. Died 10 April 1918 aged 39. 5736 Private Arthur Walton of the 2nd Dragoons (The Scots Greys), the Household Cavalry. Died 10 September 1914. PLY/18473 Private Harry Waye of the Royal Marines Light Infantry, HMS Carnarvon. Enlisted 16 October 1915. Son of William and Mary Ann Waye. Born in Calstock 1 October 1898. Died 20 February 1918 aged 19. 8469 Private Frederick Weekes of the 1st Battalion, the Devonshire Regiment. Son of Thomas and Jessie Weekes of Moor View Terrace, Yelverton. Born in Newton Ferrers in the September Quarter of 1890. Died 25 September 1916 aged 26. 14591 Gunner James Reginald Wilson of the 5th Brigade, the Australian Field Artillery. Son of Charles and Caroline Wilson. Believed to have been born in Yelverton in the March Quarter of 1894. Died 2 November 1918 aged 25. Buried in Meavy Churchyard.